A sweet little girl with just a bit of moxie. Past: Auction; inconsistent contact with humans; isolation; little or no health and hoof care, no shelter, little or no nutritional food, fear. Present: Safety, shelter and serenity in our sanctuary; love and care; all medical needs provided for; an abundance of healthful food; consistency; comfort; security. Seeking a forever, loving home of her very own. 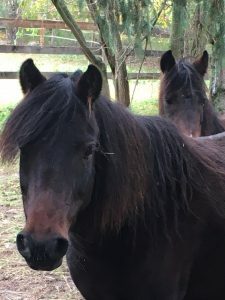 Raven, along with her equine friend Harley, came to live with us in October of 2016. She is a Welsh pony who at approximately twelve years old has a whole lot of life to live. Abandoned and neglected throughout the last decade, this girl is a diamond in the rough just waiting for her chance. We have been told that Raven is trained to drive and can be ridden. It has been a long time since she was worked, though. She will need a mature, patient individual who she can trust, so that her skill can once again shine. Join with us to make up for those who have disappointed and hurt this girl in the past. Join with us to find her a home! Join with us to show Raven she matters! Join with us to show her endless love!